The family of a rancher who was shot by law enforcement during the Oregon standoff is calling the shooting death unjustified for a second time, accusing the FBI and Oregon State Police of a cover-up. Rancher LaVoy Finicium was shot by Oregon State Police officers during an attempt to stop and arrest the leaders of the Malheur National Wildlife Refuge occupation, then on its 25th day. Protesters took over the refuge’s federal building to protest the arson convictions of two other ranchers, as well as to express anger of federal land policy. “At this point, based on additional information we have now received, it is our position that not only was the shooting death of LaVoy Finicum completely unjustified, but that the FBI and Oregon State Police may also be engaging in a cover-up, and seeking to manipulate and mislead the media and the American public about what really happened,” read a statement from Finicum’s family, obtained by the Oregonian. The family said new information from eye witness accounts supplemented their previous accusation that the FBI and OSP could not show any justification for Finicum’s death. One of the passengers riding in the white Jeep driven by Finicum, Shawna Cox, allegedly gave a different account of what happened that day after she was released from custody. “According to Shawna Cox, they were being fired upon right from the outset at the second stop, before LaVoy exited the vehicle. Bullets had already come through the front windshield….there was no question that LaVoy was trying to draw gunfire away from the others in the vehicle,” read the statement. Cox told the family that it was clear LaVoy had his hands in the air and meant to keep them there, not to pull out a firearm. “[The] best explanation for LaVoy’s arguably furtive hand movements, and why he lowered his hands and reached for his side at one point is because he had already been shot, and he was reaching toward the area where he had been hit as an involuntary physical reflex…before being shot again and collapsing,” read the statement. Cox said Ryan Bundy was wounded during the attack, and that in addition to the gunfire they were “terrorized by repeated smoke and pepper bombs.” She also said law enforcement did not make “any attempt to provide any meaningful or timely medical attention to LaVoy,” according to the statement. In its previous statement, the family said they thought LaVoy’s movements were animated and said, “there are always at least two sides to every story…they didn’t know exactly what happened.” Now with Cox’s account, they are less convinced about the FBI account. “After re-reviewing the extended video with better technology, we want to reiterate that we are not accepting at face value the FBI’s statement that LaVoy was actually armed,” the statement said. The FBI released a 26-minute aerial video, without audio, of the tactical operation, including graphic footage of the shooting on January 28. 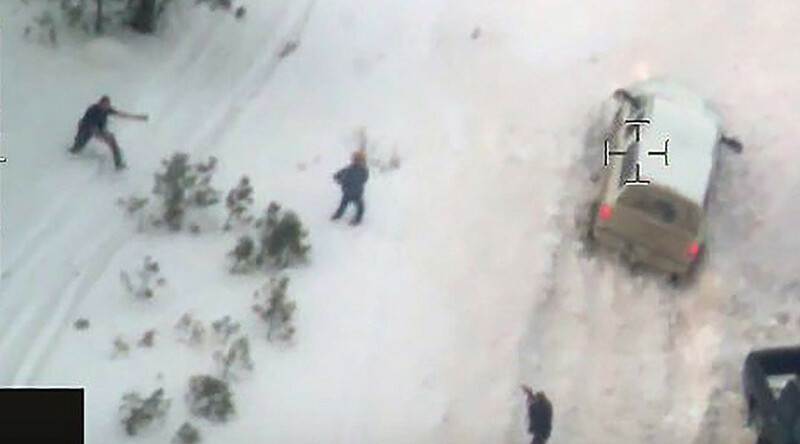 The agency said they were releasing the video to counteract inaccurate and inflammatory accusations that the agency had been involved in killing Finicum in “cold blood.” The FBI also held a press conference and issued a formal statement interpreting the video. The Deschutes County Sheriff's Office in Oregon, announced Tuesday that an investigation into the shooting won't be released for another four to six weeks.